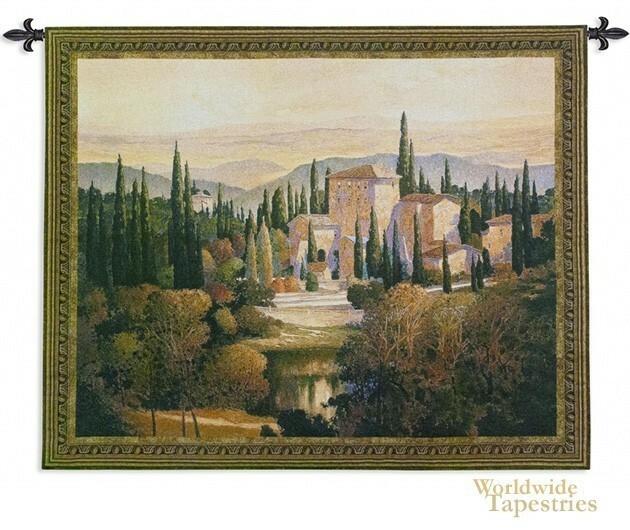 In this tapestry, "Song of Tuscany" we see a gorgeous Tuscan villa in the idyllic Tuscan landscape by Max Hayslette. Full of Tuscan charm, the works of the Tuscan countryside is captured here by the light which highlights the villa and creates a reflection of light on the pond as well as the tips of the trees in the background and foreground. The use of color and composition to highlight the mild and idyllic climate of Tuscany is a hallmark of Hayslette's works. This Tuscan landscape tapestry "Song of Tuscany" is backed with a lining and has a tunnel for easy hanging. Note: tapestry rods and tassels, where pictured, are not included in the price.